This article is about the icebreaker launched in 1909. For the Finnish icebreaker handed over to the Soviet Union in 1945, see Jääkarhu (icebreaker). A. Sibiryakov made the first successful crossing of the Northern Sea Route in a single navigation without wintering. This historic voyage, which had been Mikhail Lomonosov's dream, was organized by the All-Union Arctic Institute (presently known as the Arctic and Antarctic Research Institute). A. Sibiryakov sailed on 28 June 1932 from the Krasny (previously Sobornoy) docks in Arkhangelsk, crossed the Kara Sea and chose a northern, unexplored way around Severnaya Zemlya to the Laptev Sea. In September, after calling at Tiksi and the mouth of the Kolyma, the propeller shaft broke and the icebreaker drifted for 11 days. However, A. Sibiryakov crossed the Chukchi Sea using improvised sails and arrived in the Bering Strait in October. A. Sibiryakov reached the Japanese port of Yokohama after 65 days, having covered more than 2,500 miles (4,000 km) in the Arctic seas. This was regarded as a heroic feat of Soviet polar seamen and Chief of Expedition Otto Schmidt and Captain Vladimir Voronin were received with many honors at their return to Russia. A. Sibiryakov continued in service until World War II under the command of Captain Anatoli Kacharava. On 25 August 1942 she was sunk after an unequal fight with Kriegsmarine heavy cruiser Admiral Scheer off the northwestern shores of Russky Island in the Nordenskiöld Archipelago during Operation Wunderland. A. Sibiryakov was originally armed only with several 76 mm (3 in) and 45 mm (2 in) guns, plus a 102 mm (4 in) gun added by 1942, but she was no match for the heavy cruiser, mounting 280 mm (11 in) main guns. However, radio transmission from A. Sibiryakov before and during 1-hour battle alerted east and west bound Russian convoys, allowing them to avoid the area. Most members of A. Sibiryakov's crew and civilians died in battle or went down with the ship. 22, including severely wounded Captain Kacharava, were captured by the Germans. Only one sailor, stoker Pavel Vavilov, managed to reach Beluha Island and was picked up by a Russian ship 34 or 35 days later. In total only 15 crew members survived the war. Soviet sources say 79 killed, 19 taken as prisoner-of-war of whom 13 survived. When the Finnish icebreaker Jääkarhu was handed over to the Soviet Union, it was renamed Sibiryakov. Dikson Island, initially Dickson, is the name of an island in Taymyrsky Dolgano-Nenetsky District, Krasnoyarsk Krai, Russia, situated in the Kara Sea near the mouth of the Yenisei River. A nearby urban-type settlement of Dikson, which functions as a port and hydrometeorological centre is located on the mainland across from the island. It is served by the Dikson Airport. Yermak was a Russian and later Soviet icebreaker. It was the first polar icebreaker in the world, having a strengthened hull shaped to ride over and crush pack ice. Alexander Mikhaylovich Sibiryakov was a Russian gold mine and factories owner and explorer of Siberia. The Svetlana-class cruiser was the first class of light cruisers built for the Imperial Russian Navy (IRN) during the 1910s. Construction was interrupted by World War I, the Russian Revolution and the Russian Civil War. Only Svetlana of the quartet was completed by the Soviet Union as a cruiser, two were converted to oil tankers, and the remaining ship was scrapped without being completed. Russky Island, also spelt Russkyy and Russkiy, is an island in the Kara Sea. It is located in the Litke Islands subgroup of the Nordenskiöld Archipelago. Operation Wunderland was a large-scale operation undertaken in summer 1942 by the Kriegsmarine in the waters of the Northern Sea Route close to the Arctic Ocean. 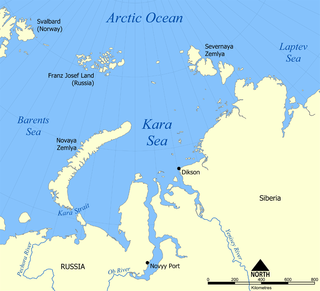 The Germans knew that many ships of the Soviet Navy had sought refuge in the Kara Sea because of the protection that its ice pack provided during 10 months of the year. The first icebreaker Krassin was built for the Imperial Russian Navy as Svyatogor. She had a long, distinguished career in rescue operations, as well as a pathfinder and explorer of the Northern Sea Route. She has been fully restored to operating condition and is now a museum ship in Saint Petersburg.